I said On Wednesday that Tuesday night's interrupted sleep was unusal. After Wednesday and Thursday nights it was becoming less unusual. Grah! We think maybe ThingOne wasn't enjoying being somewhere new. Or she may have been cold (despite the nice weather the cottage was cold). She was exhausting us during the day as she wants to run around everywhere, and then keeping us up during the night. Just not on! We'd planned to drive up the coast, perhaps to Cromer, on Thursday. As it was we were shattered (Anne and I were - I don't think ThingOne was) so we stayted more local and took ThingOne to another farm. 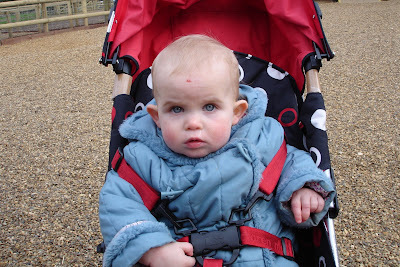 This time it was Junior Farm in Wroxham. It was good fun. Anne got to feed milk to a lamb, and we had a great time watching ThingOne interact with the animals. Now ThingOne's walking she's having more dramatic accidents than before. She fell over on the concrete in Yarmouth on Wednesday and grazed her head, and then at the farm she fell over on gravel onto her head. Oh dear. She was under my watch so I felt bad, but she didn't cry for long. "Look Anne - there's dirt on her nose", I said. Anne went ballistic: "THERE'S BLOOD ALL OVER HER FOREHEAD!". I'd missed that. Oops. Here's a photo of her with her new scab. The pygmy goats were particularly funny-looking, and ThingOne seemed to enjoy stroking them. One of them ate her Junior Farm sticker, which was a shame. We returned home on Friday, tired. A good first holiday together (let's hope she sleeps more next time).